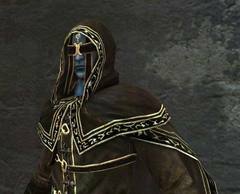 Navlaan is a corrupted sorcerer currently imprisoned in Aldia's Keep. Navlaan was executed along with his entire village long ago according to the descriptions in a number of hexes. Long ago there was a gifted sorcerer named Navlaan, who likely studied at one of the famous Magic Academies. Perhaps a personal tragedy had happened in his life and he had lost a loved one, or perhaps he simply desired strength. Whatever the reason Navlaan sought to restore the banned art of resurrection. His research drew him to the Dark, and perhaps this brought him some success. Navlaan was able to create esoteric spells like Darkstorm and Scraps of Life. But from the Dark comes hexing and hexing is viewed as a perilous affront to all life, banned in most lands. Hexes are an expression of human depravity, born of jealously, humiliation, love and hatred, the very things that reflect the true essence of life itself. Because of this, Navlaan was exiled, likely to his home village. But this did not dissuade him and he continued in his attempts at resurrection. Hexes such as these that tamper with life itself, are particularly abhorred. It is likely then, that the less tolerant authorities of his land discovered Navlaan’s work and brought what they believed to be an end to the whole affair. They executed Navlaan, along with his entire village, and the mere utterance of his name became a crime. This heavy handed punishment is very telling of the attitude towards hexes in that time and would have served as a stern warning for any following in Navlaan’s footsteps. It is likely that this extreme act of ‘justice’ would have been whispered about in every household of the kingdom, despite the taboo around his name. And so it was that Navlaan’s story came to an end. But history, as they say, repeats itself. A brilliant young sorcerer, likely studying in the Melfian Magic Academy to the south, received word that the Kingdom of Drangleic was requesting the gifted and ambitious for assistance in their cause. The keen mind of this sorcerer already understood that the staff of the Melfian academies were disdainful of anything new, had no interest in truth, had paltry ambition and were beset with petty squabbles. The academies were no place for a student with any ambition. Perhaps at this stage his mind had already felt drawn to investigate the Dark, for we hear from Felkin that it was at the academy that he too first discovered the Dark. Those who choose the path of Dark are admonished by all manner of sorcerers, but this does not stop the curious from being drawn to this strangely alluring craft, and this pull eventually led him to Drangleic, a land where Dark runs deeper than anywhere else. So this young sorcerer took up the offer. He, along with several of the greatest minds, converged in Aldia to weave strange new rituals. The fields these great minds studied were diverse and the goals ultimately varied, though all seemed to be tailored towards uncovering the truth of the Curse and perhaps even finding a cure. The brilliant young sorcerer cast away his earthly desires and devoted himself to research of the nebulous Dark. This “naïve” sorcerer set about devising new spells, dreaming of bringing new forms of magic into the world. Perhaps the sorcerer had once been an astrologist of the Melfian Magic Academy. These astrologists believed that magical powers can be obtained at moments of special heavenly alignment. In essence, they are seeking new forms of magic and so their goals align with that of the brilliant young sorcerer’s. But it is easy to see how one could become disillusioned with the astrologists, despite their ideas leading to the creation of new and very useful magic devices, the collective wisdom of the Melfian Magic Academy cannot simply pull magic out of the sky… So this scholar began his true study in Aldia. Perhaps he worked alongside a fellow hexer from the academy, by the name of Felkin. They certainly seem to share similarities. It may be that Navlaan is the enduring will of a sorcerer who was executed long ago, taking control of another’s body to act out his will. There are multiple occurrences of in game text questioning whether a sorcery could ever have a will of its own, and perhaps this is to imply that ‘Navlaan’ is not a sorcery, but rather a hex. Hexes as we know can have wills of their own, and this is proved with spells like affinity. Even if the hex only has a fleeting will, it still has a will based on the caster’s intentions. We can also see the power of Dark in the story of Artorias. This brave knight had only the best intentions, to defeat an ‘evil’ and save the Princess of Oolacile. But he was consumed, the Dark took control of his actions, and he ceased to be. It is also interesting to note that Navlaan appears to be a Fenito, as his skin is blue. We know that Fenito were created to watch over the Undead Crypt, but that they are also able to wander away from this place (as we see with the Grave Wardens at Earthern Peak). Fenito also have a natural affinity for the Dark. Perhaps Navlaan, after being executed, was buried within the Undead Crypt. His will may have endured (perhaps due to some success with his resurrection spells) and this Fenito may have discovered it. This seems unlikely, though still possible, because we are told through SotFS item descriptions that Navlaan was once a brilliant sorcerer. It seems odd that a Fenito would begin their study with sorcery, though not impossible, as we can see that certain spells, including sorceries, are preserved only in the Undead Crypt. But why would the will of a sorcerer who lived long ago and attempted to resurrect people, become obsessed with killing? In essence, doing the exact opposite of what he had sought in life. This fact does not add up. After being confined to his cell, Navlaan could not kill anymore, so he had to find other ways to slake his thirst for bloodshed. He achieves this by living vicariously through the player. Navlaan asks the player to complete a series of assassinations. What Navlaan tells us is that he sought to prove strength by killing. He will ask us to kill Laddersmith Gilligan, a greedy foul man, Cale the Cartographer, the “maniac” who studied Navlaan, and Felkin the Hexer, the man with the “peculiar” sceptre (perhaps his old class mate and colleague) before finally settling on the Emerald Herald. Navlaan believes, and is most probably correct in this, that the Emerald Herald is the last Fire Keeper, but he does agree with her cause. The Emerald Herald seeks to continue the Age of Fire and shepherds the undead to sacrifice themselves to link the flame. Navlaan is a disciple of Dark. We can already see why these two would have conflicting interests, as any disciple of Dark would be interested in continuing the Age of Dark. But it may be for a more simple reason that Navlaan seeks the Emerald Herald’s blood (or feather); she continues the Age of Fire by shepherding the undead, so if she were killed then that may bring an end to that Age, and exhibit the ultimate example of strength through murder. Navlaan considers the Emerald Herald to be someone of true importance for affecting the order of the world, and we know what he believes her role to be. Once the player has done away with the Emerald Herald, Navlaan will be satisfied to wait out his days in the cell, having no regrets. Perhaps he rejoices over a point proved or the coming Dark, finally at peace. It is interesting that Navlaan is known as a Chaos sorcerer. The word ‘chaos‘ is only ever used in the Dark Souls universe in connection with the Daughters of Chaos. These sisters are the roots of flame sorcery and pyromancy. We know for certain that hexing is rooted in both sorcery and miracles, but what about pyromancy? It may be that Navlaan or the brilliant sorcerer who would become Navlaan, did manage to bring about new forms of magic, hexes created from pyromancies. In Dark Souls 1, the pyromancy “Black Flame” is available, and this is clearly related to the Abyss. 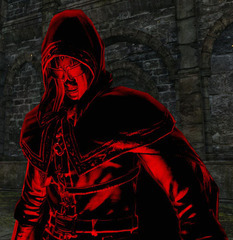 In Dark Souls 2, Nadalia created “Outcry”, a pyromancy that spouts multiple Dark Flames. These are alternate manifestations of pyromancy, but not hexes. What spells did Navlaan create? Darkstorm and Scraps of Life. Darkstorm especially seems to have no comparison in the fields of sorcery or miracles, but it certainly seems to resemble the pyromancy Chaos Storm. The Chaos Storm spell is the art of the Flame of Chaos, which engulfed the Witch of Izalith and her daughters. Darkstorm behaves in a similar way, creating a storm around the caster, though this time in a vortex. Perhaps Navlaan truly was a pioneer in his field, and helped bring about new hexes based on pyromancies. He may not have been the first to do this as we can certainly see some similarities between the pyromancy Toxic Mist and the hex Black Fog. These spells are both considered to be perverse and Toxic Mist is even said to be a diversion from the art of fire. It is also interesting that though Navlaan has the Sunset Staff depicted on his Chaos shield, and it is very powerful for casting hexes, he does not use it to attack us. Instead, he uses his fists, almost as if he has created his own hex based version of the pyromancy hand, drawing Dark from within himself. Navlaan seems to have connections to other characters within the game. How he knows about Gilligan is unclear, but hints that maybe Gilligan has been in Drangleic for a long time, and that he was perhaps sent to the Harvest Valley as punishment, likely for stealing. We do not know where the Melu Scimitar was before it was (likely) taken by Gilligan, but perhaps it resided in Aldia’s Manor. Navlaan also mentions that Cale the Cartographer “touched” him like he was “some rare specimen” while Navlaan was trapped in Aldia’s Manor. It seems only likely that either Cale found a way into the Manor in his attempts at creating a map of the entire land and met Navlaan there, or he was one of the minds called to Aldia to combat the Curse. There is also some connection between Felkin the hexer and Navlaan. They seem to share a common origin story, and both have connections to the Sunset Staff, so it could be concluded that they are both from Melfia to the south, drawn to Drangleic where Dark runs deeper than any other land. Finally, the Emerald Herald as we know is a creation of Aldia. She was rejected because she did not fulfil the purpose for which she was created (likely to end the Curse by being the last Firekeeper), and as a resident of Aldia, there is no need to speculate how Navlaan could know about her. To conclude, it would seem that the man we know as Navlaan is simply a brilliant sorcerer called to Drangleic, who became obsessed with the Dark, but ultimately could not reconcile the true nature of the Dark soul he discovered with the desires he had within himself, and so created an alter ego based upon the ancient heretic Navlaan. This is evidence that Navlaan was not always his name, and in fact belongs to his alternative personality. Navlaan suffers a split personality and his host's name is never known (and may in fact be lost). 2. We know that Navlaan is a sorcerer, and that Aldia too was a sorcerer. 3. Navlaan is called a Royal Sorcerer. This seems a likely title that Aldia would have kept. 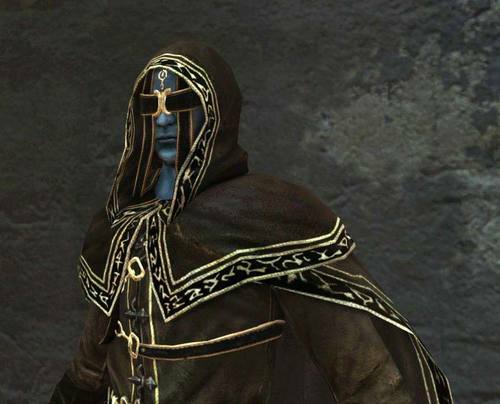 If Aldia was Vendrick’s brother he would be considered royalty. He would be known as a sorcerer and not a pyromancer or cleric (as there are pyromancies, and miracles made at Aldia’s manor too) because Drangleic embraced sorcery, rejected clerics and pyromancers are uncommon. "Key used in the mansion of Aldia. eventual withering of familial ties." " A staff said to have been forged in Aldia. A catalyst for sorceries and hexes. Particularly powerful for casting hexes. with malformed beasts that roamed its halls." locked Aldia up in his manor, confining him perhaps till a solution could be found. 7. Finally there is the meaning behind the assassination missions he gives you. a. Laddersmith Gilligan: Gilligan is a scoundrel and there are already many out for his life. Navlaan is testing you to see if you would be willing to kill for him. her. His most promising experiment turned out to be a failure that works against him to perpetuate the cycle. It seems that Navlaan's evil personality is a Mr Hyde-style alter ego and not a malevolent spirit possessing an innocent man. This can be inferred from his dialogue, which states that the evil personality was "created". There is strong evidence that Navlaan started out in the mansion in Majula. his entire village,"), and Majula is the only village ever seen in Drangleic. 2. The mansion contains a study with a large book, implying that a scholar of some sort lived there. 3. There are skeletons in the basement, implying that a necromancer lived there. 4. The key to the mansion is obtained from Cale, who Navlaan claims "touched" him. This could be how Cale obtained the key in the first place. It is stated that Navlaan was executed, leading many to believe that the evil personality is the spirit of Navlaan possessing an innocent scholar. Navlaan's dialogue contradicts this however. Therefore it can be inferred that Navlaan was not really executed, but was instead sent to Aldia's Keep to help Aldia with his experiments. 1. P-please, just stay away. No, please, don't come near me. Nothing good will come of it. 2. Just leave me alone, please. Leave this place, and leave me be, as I'd not see any harm befall you. 3. Please, just leave me alone. I haven't said anything strange, have I? I have absolutely no intention of leaving here. Are you tormented by memories? Burdened by guilt? 2. This? This contains my power. Long ago…This…naive vessel of mine set about devising new spells. The fool dreamt of bringing new forms of magic into the world. But instead, he created me. Mostly by chance, but he did a fine job, I must say. What he sought was strength. And so, I decided to demonstrate. While my vessel slept, I'd find my mark, and hunt him down. But my vessel did not approve. And so while I slept, he sealed the both of us away. 3. Now, I don't have anything against humans, but how is it that you go about defining good and evil? I'm only using what the Gods gave me. How can that be so wrong? So, what say you to a spot of murder on my behalf? If you don't, I'll leave this place, and take more lives. Many more. I couldn't give a fig either way. So, what's your choice? Yes, yes, of course. Forget that I asked. That's what "good people" do, am I right? Ah hah hah, now you're getting nervous, hmm? 1. Yes, I see, how very kind of you. I want you to kill a merchant named Gilligan. A greedy, foul man. He won't be missed, I assure you. Hmm…Yes… Bring me a Ladder Miniature as proof. 2. I want you to kill a merchant named Gilligan. 3. Heh heh heh…Fine work. Now, let's discuss our next mark. 1. I want you to kill one more. Your target will be Cale, the man who's drafting that map. While I was trapped in here, he touched me, that maniac, like I was some rare specimen. He wore a strange helm. Bring it back as proof. 2. Yes, I knew I could count on you. Perhaps this will slake my thirst. 3. I want you to kill Cale, the cartographer. Bring his helm as proof. 4. Heh heh heh…Fine work. You target is Felkin, the hexer. As proof, bring me that peculiar sceptre of his. But he will be formidable. Be cautious. 3. I want you to kill Felkin. That's Felkin, the hexer. He has that sceptre. Bring it to me as proof. Now, let's discuss something of importance. 1. You could kill a dozen like that, and it wouldn't matter. I want you to kill someone of import. I want you to kill the girl in Majula known as the Muse. That she's a gentle shepherd, lighting the way for you cursed fools. Nonsense. Once she is dead, I will have no regrets, and I will be content to remain here. The girl will have a peculiar feather. Bring it to me. 2. Your mark is the girl in Majula known as the muse. 3. Yes, that's the feather. Good, oh that is very good! You've been good to me. Go on, tell me what you need. I hope you appreciate the ramifications. Well, no matter. What's done is done. Hmm, ooh…Hah hah hah hah! Not bad at all. Boosts magic within the body beyond even your own limits, but at great cost to HP. The terrible deeds carried out in Aldia led to the unintentional birth of several shadowy things, all of them eerily malformed. Pyromancy developed in Aldian rites. Fires a giant fireball with a widely encompassing explosion. What could possibly justify such excessive destructive power? In all likelihood, the madmen of Aldia never even questioned the need. An esoteric spell created by Navlaan, the infamous exiled sorcerer. Awakens the souls of the long-buried dead. The heretic Navlaan was executed along with his entire village, and the mere utterance of his name became a crime. Some say it was because he sought to restore the banned art of resurrection. An esoteric spell created by Navlaan, the infamous exiled sorcerer. Creates a local vortex of dark flame. The heretic Navlaan was executed along with his entire village, and the mere utterance of his name became a crime. Some say it was because he sought to restore the banned art of resurrection. Hood worn by a chaos sorcerer. He calls himself Navlaan, now. Hood worn by a chaos sorcerer. The man claims to have sealed himself away, but who's ever heard of sentient magic? It is no doubt difficult to judge the veracity of the man's words, but this hood certainly seems to possess an unusual power. Rapier of darkness and chaos Navlaan claims to have sealed himself away to prevent tragedy, but could a sorcery truly possess a will of its own? Truth can be elusive, and the tales surrounding him are questionable. Only, it is clear a strange power possesses this rapier. Rapier of darkness and chaos. Once, a brilliant young sorcerer cast away his earthly desires, devoting himself entirely to the Dark that bewitched him. Nebulous, inky and serene, the Dark holds an allure matched only by the fear it strikes in men's hearts. Could it be nature, holding a mirror to mankind? Shield of darkness and chaos Navlaan claims to have sealed himself away to prevent tragedy, but could a sorcery truly possess a will of its own? Truth can be elusive, and the tales surrounding him are questionable. Only, it is clear a strange power possesses this shield. Shield of darkness and chaos. Once, a brilliant young sorcerer cast away his earthly desires, devoting himself entirely to the Dark that bewitched him. Nebulous, inky and serene, the Dark holds an allure matched only by the fear it strikes in men's hearts. Could it be nature, holding a mirror to mankind?